Al-Qaida affiliate al-Shabab killed 20 people in four car bombings Friday. The attack targeted the Sahafi Hotel, which is frequented by government officials. Gunmen attempted to storm the hotel but were gunned down by security. 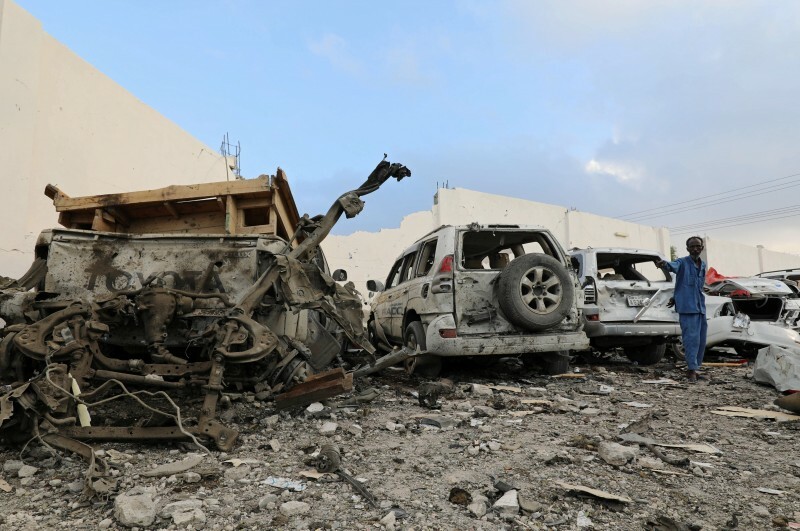 A series of four Islamic terrorist car bombings killed at least 20 people outside a hotel in the Somalian capital of Mogadishu Friday, The Associated Press reported. Three of the suicide bombers struck in quick succession outside the hotel — blasting a hole in the wall — while a fourth waited to strike until medics arrived, according to the AP. Four gunmen tried to storm the Sahafi Hotel through the breach from the first three explosions, but guardsmen gunned them down before they could enter. Al-Shabab, the main Islamic terror organization in Somalia, took credit for the attack. “Although they failed to access the hotel, the blasts outside the hotel killed many people,” Somali Police Captain Mohamed Hussein told the AP. The hotel’s manager, Abdifatah Abdirashid, was among those killed in the attack. That manager’s father, the original owner of the hotel, was killed in another al-Shabab attack in 2015. The hotel is a frequent target of attacks because of how often government officials stay there. The bombs went off during rush hour just after 4 p.m., when the streets and sidewalks were packed with commuters, according to WaPo. While 20 casualties is no small number, it is far from al-Shabab’s deadliest attack in the city. The organization carried out a series of truck bombings in the city in 2017 that killed more than 500 people. The same terror organization bombed a government security conference, killing 12 in 2016. A U.S. special forces operator was killed and four more were injured in a gunfight with al-Shabab extremists in June as well. The American service members who were killed and wounded in the battle came under small arms and mortar fire near the town of Jamaame while on a training mission with local Somali forces. The incident came months after U.S. military airstrikes killed a number of al-Shabab members in March.